The UK government is unlikely to meet its target of 10% of electricity being generated by renewable sources by 2010, a committee of MPs has warned. The Innovation, Universities, Science and Skills Select Committee called the policy inadequate and was disappointed by an apparent "lack of urgency". It added that the wait for planning consent was "too lengthy", and access to the national grid was "too limited". 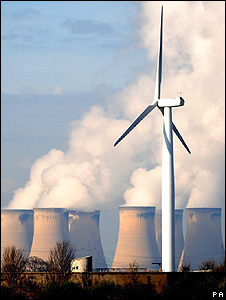 In 2006, 4.6% of the UK's electricity came from renewable sources. "Throughout this inquiry we have been consistently disappointed by the lack of urgency expressed by the government, and at times by the electricity industry, in relation to the challenge ahead," said committee chairman Phil Willis. "It is immensely frustrating that, on the one hand, the government is encouraging the deployment of renewable technologies," he added. "But on the other, these technologies are unable to commence electricity generation due to a poorly conceived transmission access regime." The MPs said that there was already a waiting list for projects to be connected to the national grid. In Scotland, for example, there was 9.3 gigawatts of wind energy capacity waiting to be connected. They also warned that there was a shortage of skills needed to construct installations, which could also threaten efforts to have 10% of the UK's electricity coming from renewable sources by 2010. Dr Mark Williamson, director of innovations at the Carbon Trust, said he was hopeful that the push for more renewables would gather pace. "The UK, while currently at a low base for renewables, has a fantastic opportunity to fast-track the development of a number of key technologies, such as offshore wind and marine energy," he observed. "Not only will this deliver significant carbon reductions but it should also deliver significant economic returns." In March 2007, the EU adopted a common energy policy, which committed the bloc to generating 20% of its total energy consumption from renewable sources by 2020. At the beginning of 2008, the European Commission proposed that in order to meet this goal, the UK needed to derive 15% of its energy from renewables by 2020. In their report, the MPs said that if the government was to meet this goal, then about 35% of the UK's electricity would have to come from technologies such as wind, wave and biomass. "It is therefore critical that the government takes steps to support the widespread deployment of renewable electricity generation technologies as a priority, both at a level of macro and microgeneration," they concluded. Ministers are expected to issue a formal response to the committee's findings in the coming months.